A stem cell donor asked the stranger whose life he saved to be the best man at his wedding. Brett Dingwall survived life-threatening acute myeloid leukaemia (AML) after he was treated with Paul Rogers's donated cells 10 years ago. The pair met up after the two-year prescribed anonymity window and struck up a close friendship. Mr Dingwall said: "When Paul asked if I'd be his best man, he knew I owed him more than that. I owed him my life." 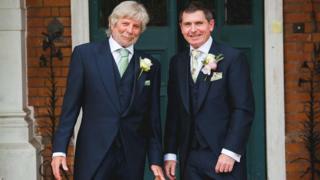 The 67-year-old joined Mr Rogers and his wife Laura as the pair were married at St Paul's Walden, near Hitchin. Retired boat-builder Mr Dingwall, from Bricket Wood, was diagnosed with AML while on holiday in Monaco in October 2006. He began treatment at the Royal Marsden Hospital and was told his last chance of survival would be a stem cell transplant from an unrelated donor. Mr Rogers, 51, was found to be a perfect match. After a transplant, donors and recipients must remain anonymous for two years, but are allowed to exchange correspondence anonymously through Anthony Nolan. Mr Dingwall sent Mr Rogers a thank you letter and a Christmas card, and received replies. After the two years were up, the men realised they lived close to one another and met up. Mr Rogers, 51, whose dad died from leukaemia, said meeting Mr Dingwall was "pretty emotional". They enjoyed days out on Mr Dingwall's boat and kept in touch on-and-off over the years. "Six months ago I thought, oh my word, who's going to be my best man? "Then I thought, wouldn't it be amazing to have Brett as my best man? I'm so proud to be his friend," said Mr Rogers. Mr and Mrs Rogers married on 13 May.